The new Rookie tennis ball machine is hand-crafted by American workers in Ohio by Match Mate Tennis. 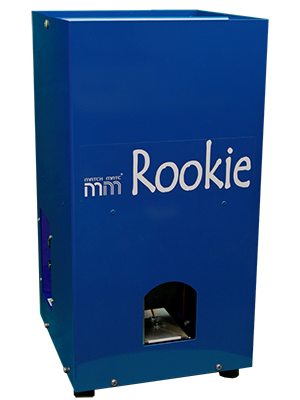 The Match Mate Rookie is the only wheel driven machine specially engineered and designed for young beginners. Great for the courts or at home in the yard or driveway. The battery will last up to 5-7 hours per charge and comes with a smart technology charger! You will never overcharge your machine! The Match Mate Rookie holds up to 70 balls. The size and capabilities of equipment for young beginners just makes sense. Look at what the USTA says about the Rookie and 10 and Under equipment. “Just like racquets, balls, and courts – the perfect trainer and playmate is the MatchMate Rookie. Weighing in at just 22 pounds the lightest ball machine available. It is American Made with a high-grade aluminum outer shell. No plastic here! The Rookie was designed for beginners. Young budding tennis stars need to develop their stroke sets, so no oscillation is installed. There is no need to be running from side to side and not working on the basics. The second feature for skill development that the Rookie offers is the triple threat of elevation, ball delay options and a ball speed range from 10 mph to 27 mph. The third skill development is the addition of heavy topspin at 27 mph. The rechargeable battery allows for up to five hours of continuous play time. With an aluminum outer shell and urethane pitching wheels, the Rookie is ready for years of use. All internal components are made from high-grade aluminum or steel. 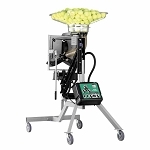 Using the Rookie requires nothing more than positioning the machine on the tennis court, setting the ball speed and feed, and turning it on. The Rookie will kindly wait ten seconds before it starts throwing balls, allowing the user to get in position. The heavy-duty battery ensures that the user will wear out long before the ball machine does.